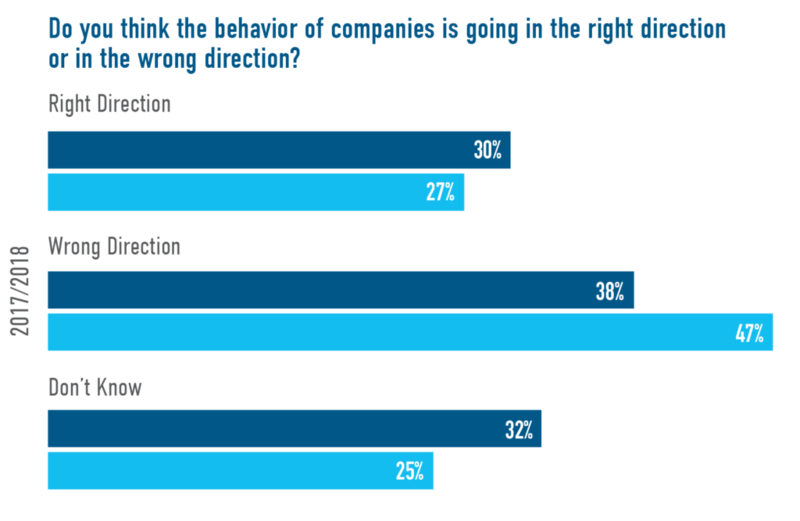 Last year, 47% of Americans thought companies were heading in the wrong direction, whereas this year, only 38% shared this view. However, while fewer Americans see business heading in the wrong direction, they’re still not sure it’s heading in the right direction. More and more, CEOs are taking a stand on issues like gender pay, discrimination, immigration, climate change, gun control, and more. We asked the public what they think about CEOs acting on important social issues. If given a choice, the majority of working Americans say they would opt to work for a more just company – even if it meant earning less pay (and in some cases, 20% less pay). Even though a question like this is susceptible to social desirability bias, it’s a remarkable finding. We also heard from an overwhelming majority that companies aren’t doing enough today, especially when it comes to workers. In particular, the results clearly signaled that Americans felt companies were prioritizing shareholder interests above all. This year, we also asked Americans: "If you could send one message to the CEOs of America's largest companies on any topic, what would your message be?" We had over 3,000 responses to this question and in over one-third Americans indicated workers should be put first.